The Problem: Because sea turtles use both marine and terrestrial habitats during their life cycles, the affects of climate change are likely to have a devastating impact on these endangered species. A rise in the sea level will impact sea turtle nesting beaches. Sea turtles' memories are "imprinted" with a magnetic map of the sandy beach where they hatch. This gives them the unique ability to return to that same site decades later to repeat their ancient nesting ritual. With melting polar ice caps and rising sea levels, these beaches are beginning to disappear. The direct impacts of sea level rise include losing beaches, ecologically productive wetlands and barrier islands. An increase in nesting beach temperatures will also have an impact on sea turtles. Because sea turtles are reptiles, they rely on the temperature of the sand in which the eggs incubate to determine the gender of the hatchling in a nest. Typically, the eggs in the lower, cooler, part of the nest will become males, while the eggs in the upper, warmer, part of the nest will become females. With increasing nest temperatures, scientists predict that there will be more female than male hatchlings, creating a significant threat to genetic diversity. Warmer ocean temperatures are also likely to negatively impact food resources for sea turtles, and virtually all marine species. 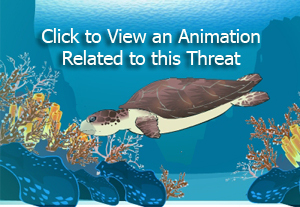 Coral reefs, which are an important food source for sea turtles, are in great danger. Almost half of the coral reef ecosystems in the U.S. are in poor or fair condition. As a result of rising temperatures, coral reefs are suffering from a "bleaching" effect that kills off parts of the reef. Case Study: Since 2005, the Caribbean region has lost 50 percent of its corals, largely because of rising sea temperatures. From 1997 to 1998 alone, mass bleaching is estimated to have caused serious mortality to 16 percent of the world's coral reefs. While strong signs of recovery have been observed in some locations, many will take decades to fully recover. In terms of sea turtle gender-ratio, the beaches at Playa Grande on Costa Rica's Pacific coast are already producing nests that are 70 percent to 90 percent female, depending on the year. At Junquillal Beach on the Pacific coast, where it is often too hot for eggs to hatch at all, scientists have begun moving eggs to nurseries â€“ essentially holes dug to a certain depth on cooler areas of the beach. When the hatchlings emerge, rangers chaperone them from the nest to the water, protecting them against human and animal predators alike.